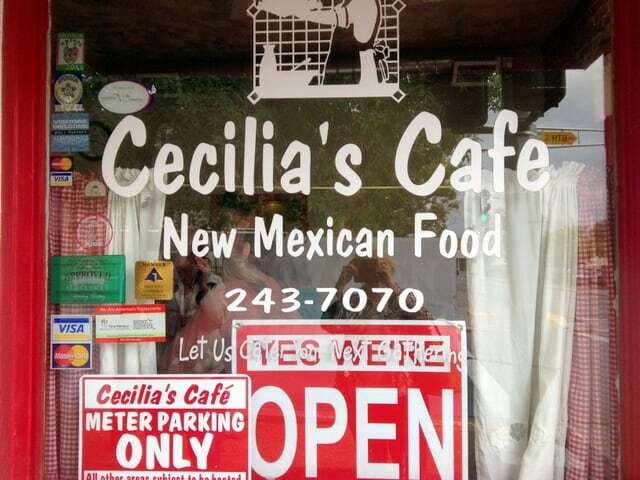 Albuquerque, NM: Like many tourists, we arrived at Cecilia’s Cafe in downtown Albuquerque at the recommendation of Guy Fieri, the celebrity TV chef from the Food Network. He’s the bleached-blond, spikey-haired guy from Diners, Drive-ins and Dives who seeks out offbeat, down-home restaurants. The streets are empty on Saturday morning so there’s no problem finding metered parking outside the building (once someone’s house) at the corner of 6th Street and Silver Avenue. Although Cecilia’s has been here for nearly a decade, the furnishings (pink and turquoise leatherette booths, and red and white gingham café curtains) seem from a bygone era. With about ten tables, a wood-burning stove, and cooking aromas wafting from the open kitchen, it’s cozy and comfortable. Cecilia Baca is as humble and down-to-earth as her namesake. “Knowing how to cook comes naturally when you’re the oldest of nine,” she says. The fair-skinned redhead comes out of her kitchen to join us at our table. She say she arrives at work by 4:30AM each day making dishes that reflect her own cultural heritage, a mix of Spanish, Irish and Mexican influences. Her sister Mary Alice fills in as our waitress that day. We ask about the differences between Mexican and New Mexican cooking. My husband orders jalapenos & eggs (scrambled eggs with peppers, onions and tomatoes, served with beans, potatoes and one tortilla) for $7.25; my son, the carne adovada (marinated pork cooked in a zesty red chile sauce with two eggs on top) for $9.75. Both are served with a choice of red or green chiles (the red ones are hotter). I timidly order blue corn pancakes for $6.75. Since it was featured on Guy’s “regional classics” show (airing in 2008) this neighborhood favorite has become legendary to foodies on Yelp, Foursquare, Urbanspoon and Trip Advisor, and has its own Facebook page. Yet, Cecilia’s still upholds its reputation for tasty, authentic New Mexican cooking.